Our 4K HDMI audio extractor is designed for home and professional audio systems, a pass-through device that converts digital surround sound or 2-channel (PCM) to L/R analog stereo out. 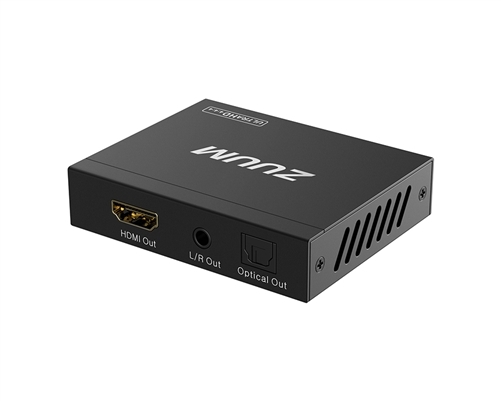 A perfect solution that will connect a HDMI output only source such as a newer Blu-ray player to a second zone or house multi-zone amplifier. This allows HDMI equipment with the latest technology (i.e. displays, audio receivers or matrix switchers) to be more backwards compatible with older analog equipment. Not only does this HDMI to analog converter improve sound quality, it auto-detects and auto-converts the audio signal, making sound come alive and more realistic. NOTE: If audio is PCM2.0 then both the optical digital port and the Analog L/R port are active at the same time; if audio is Dolby or DTS then there will be optical digital port with audio ONLY.